Brunel House is situated in Cardiff city centre, 5 minutes away from the main shopping thoroughfares and opposite Cardiff Queen Street Station. The building is one of the largest office blocks in central Cardiff and lends itself to large floor plates across 15 floors with views of the city. Brunel House has tenants such as Legal & General, Admiral, HMRC and Regus. Gpad London headed up the design of the new refurbishment of the entrance and lobby. The largest addition to the building is the fully glazed extension of the entrance allowing light to flood the main entrance. This offers an inviting space to visitors and workers alike. The new lobby features a vibrant café with open plan work and meeting areas. The interior of the building was designed to reflect its industrial nature with bronze and patinated finishes present throughout. The new design of the entrance and main reception led to a split level lobby. 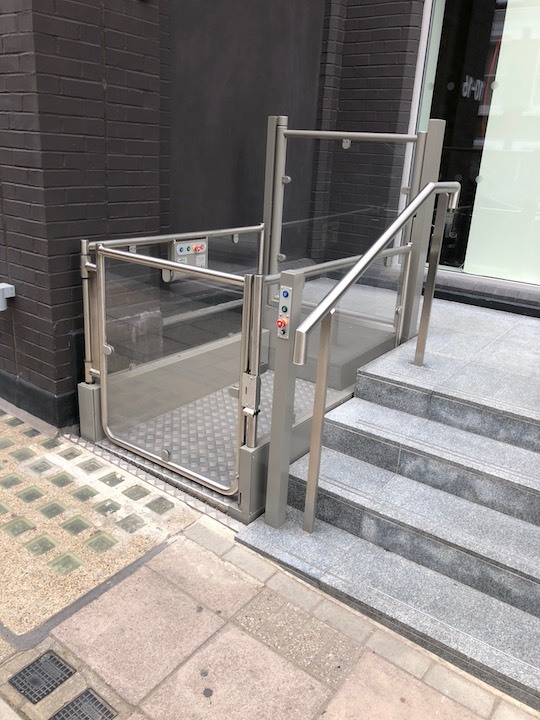 The entrance was made level with the street allowing access for wheelchair users. 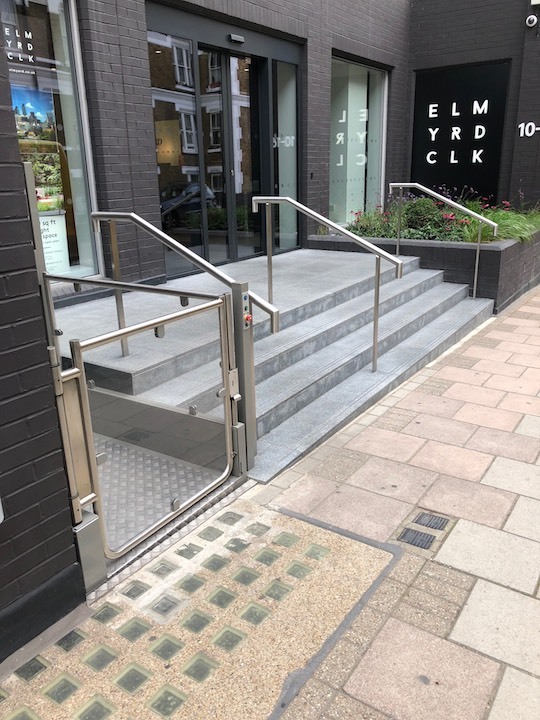 However this floor level difference created an access problem for wheelchair users between the street entrance and the main reception area. 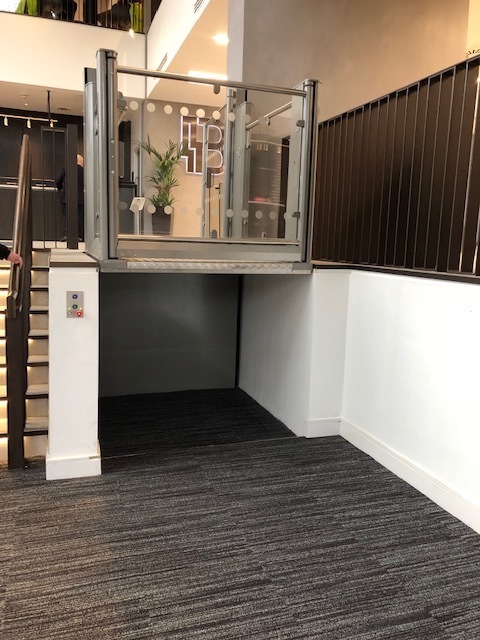 We designed a platform lift with the architect to travel the 1210mm between floors with a platform measuring 1100mm x 1400mm. The platform size offers ample space and the rated load of 400kg allows for even the largest electric mobility buggies. The light and spacious feel of the lobby was reflected in the lift with glass panels and gates giving a modern finish. The lift was installed in time for the main entrance's reopening in December 2017. 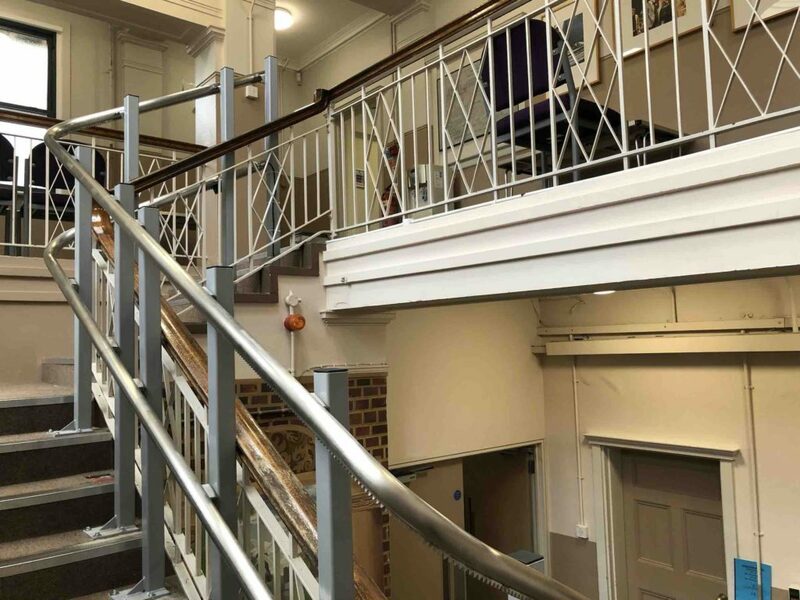 To see similar projects to Brunel House click on the following links: 200 Grays Inn Road, National Army Museum, Chiswell Street, Venture House in Reading and Seven Dials Warehouse, London. We were approached by Kier who were refurbishing an existing textile mill for Manchester Metropolitan University. Kier is one of the UK's largest construction companies and employs over 20,000 staff. 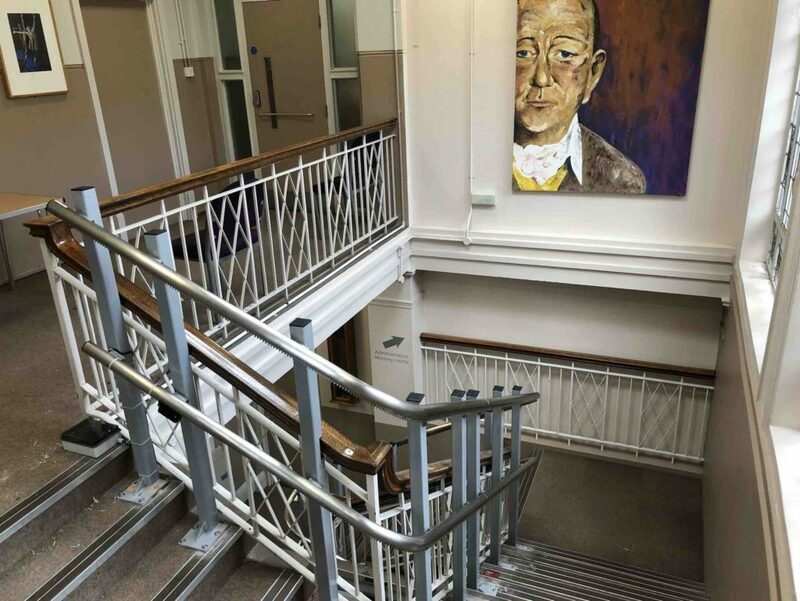 They won the £8 million contract to renovate the site at Great Marlborough Street for the University. The building at Great Marlborough Street is an old Victorian textile mill that is situated close to Manchester Oxford Road station and the Bridgewater Canal in central Manchester. The mill is one of many across Manchester that used to produce many textile goods from cotton in 19th century. The refurbishment would provide 5 floors of new office space for the University staff. 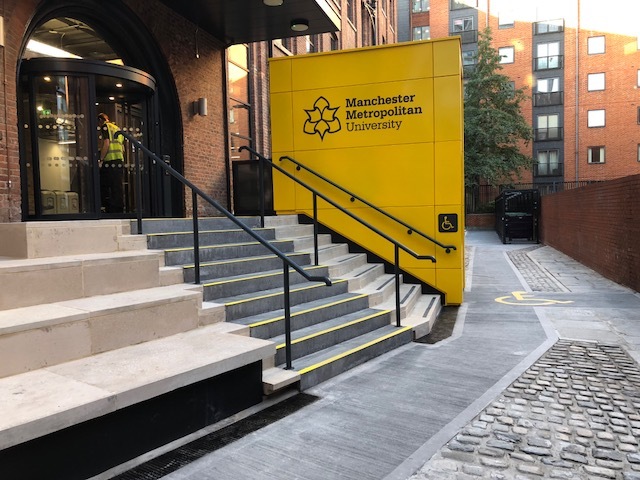 The client wanted a goods lift for Manchester Metropolitan University to make deliveries into the building easy. They wanted a lift that would be practical but would stay true to the building's industrial history. 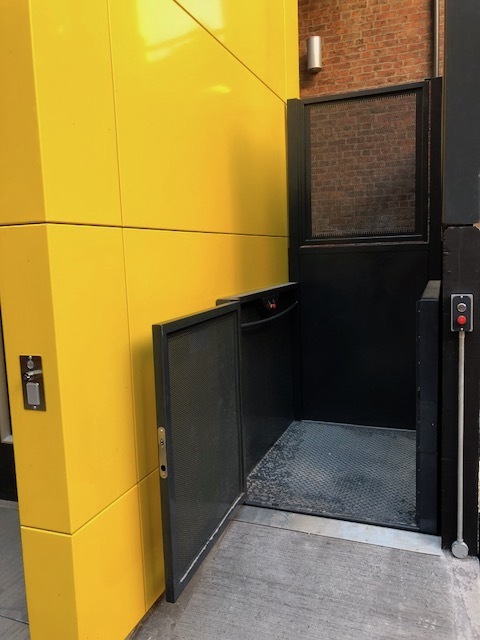 We installed a goods lift with a platform measuring 1500mm x 1120mm. 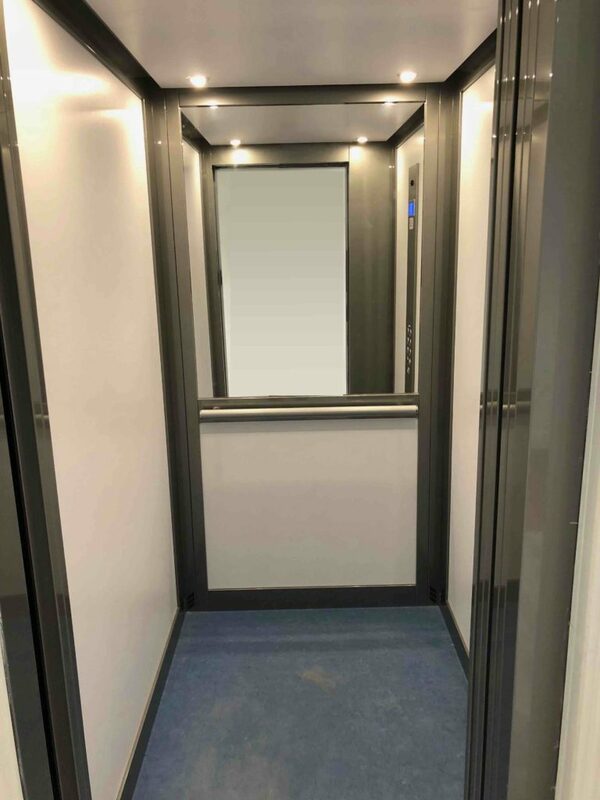 The lift travels 1900mm across the two floor levels and has a rated load of 300kg. The lift was finished in black to compliment the modern facade of the building. The client chose mesh sides and doors to match the industrial aesthetics of the building. 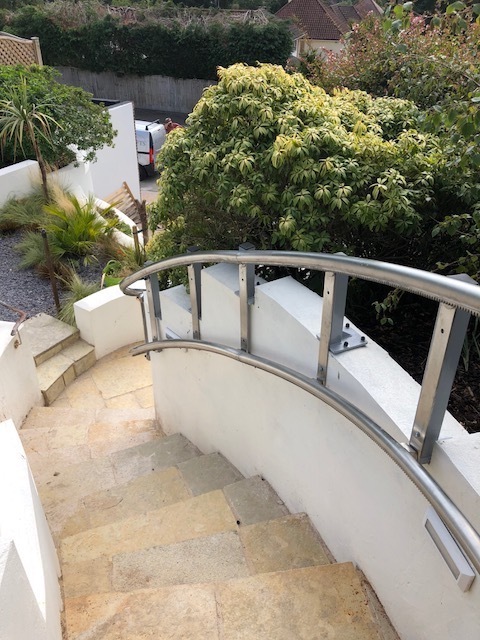 The lift is made from hot-dipped galvanised steel which means it can stand up to any weather and will not rust. 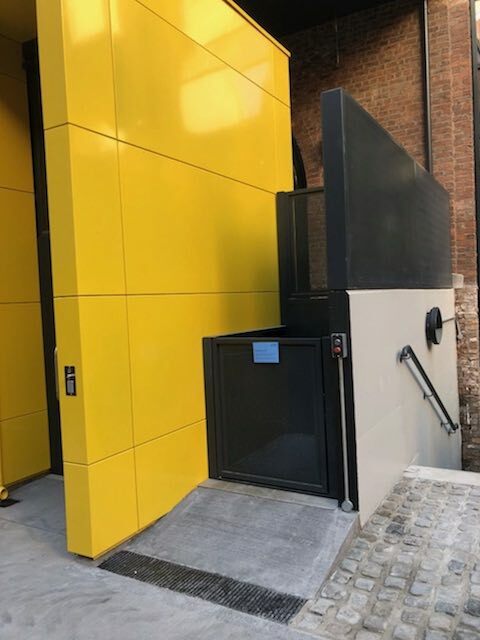 To see more of our projects similar to this goods lift for Manchester Metropolitan University click on the following links: Platform Lifts at the National Army Museum, Platform Lift at Venture House in Reading, Platform Lift at Seven Dials Outdoor Wheelchair Lift for Elm Yard and Goods Lift at Commercial Office in the City of London. 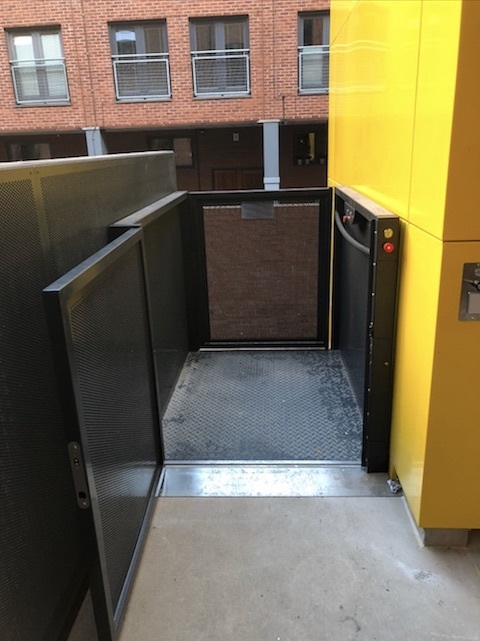 We were approached by Portakabin who were looking to install a disabled platform lift for Bristol University. 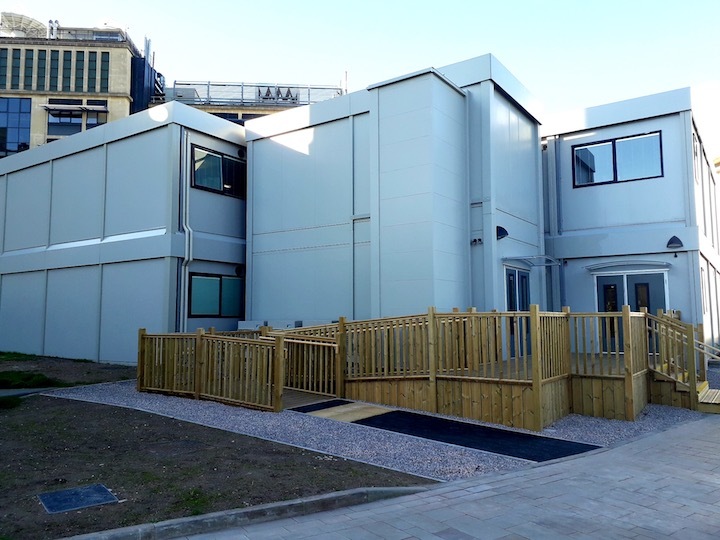 Portakabin create modular and temporary buildings with an emphasise on the education sector. Portakabin can set up their buildings in a matter of days and weeks which makes them ideal for schools and universities when they're renovating or moving sites. 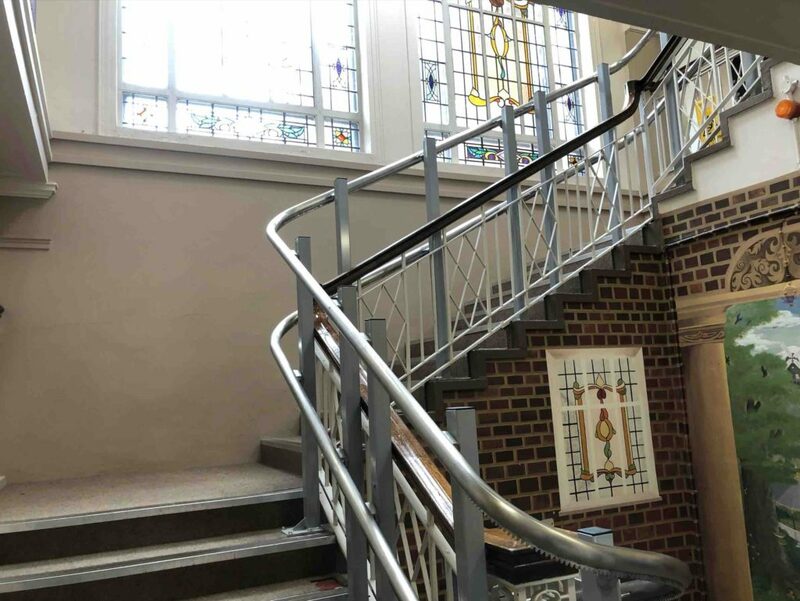 The University were looking to expand their teaching space whilst renovating their existing buildings. During the renovation works the University instructed Portakabin to build a number of new lecture halls and seminar rooms. The new block would help ease overcrowding in the existing buildings and make up for a lack of teaching space. We have worked with Portakabin on a number of sites across the country. The majority of these are made up of schools, colleges and universities. 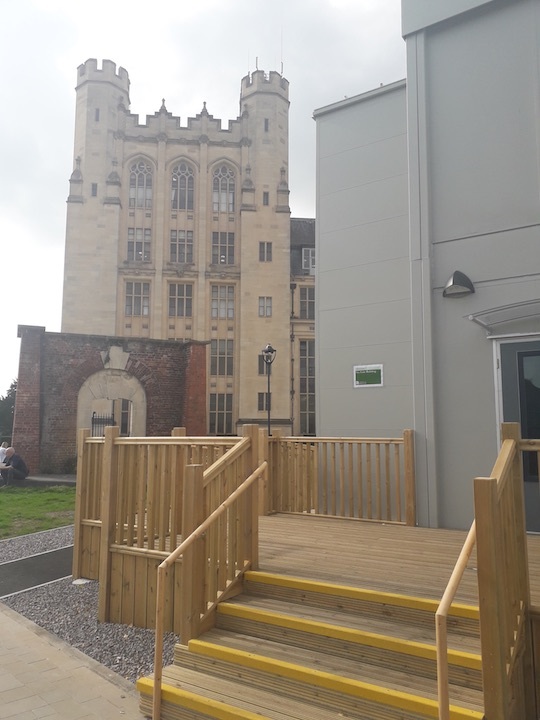 Similar to previous projects, Portakabin wanted a disabled platform lift for Bristol University that would provide access to the first floor. 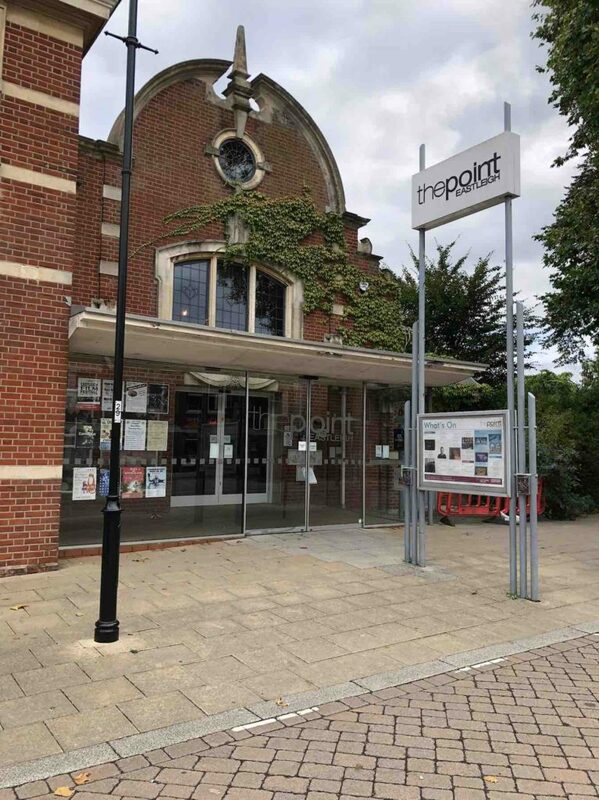 Portakabin wanted the lift to fix to the outside of the building adjacent to the entrance. The lift was fitted in its own external aluminium shaft with both points of entry on the same side. 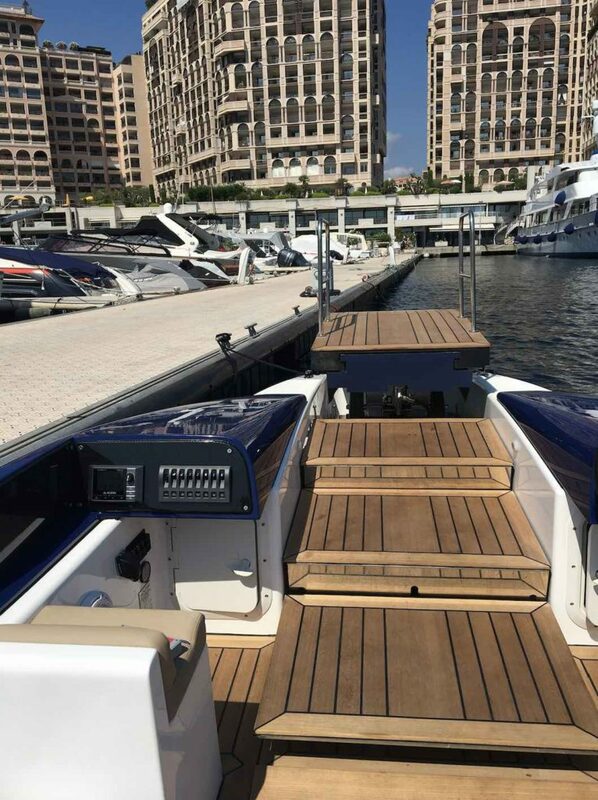 The lift travels over 3.5 metres across the two floors, with the cabin platform measuring 1100mm x 1400mm. The lift shaft was painted in RAL colour 7015 to match the rest of the building. 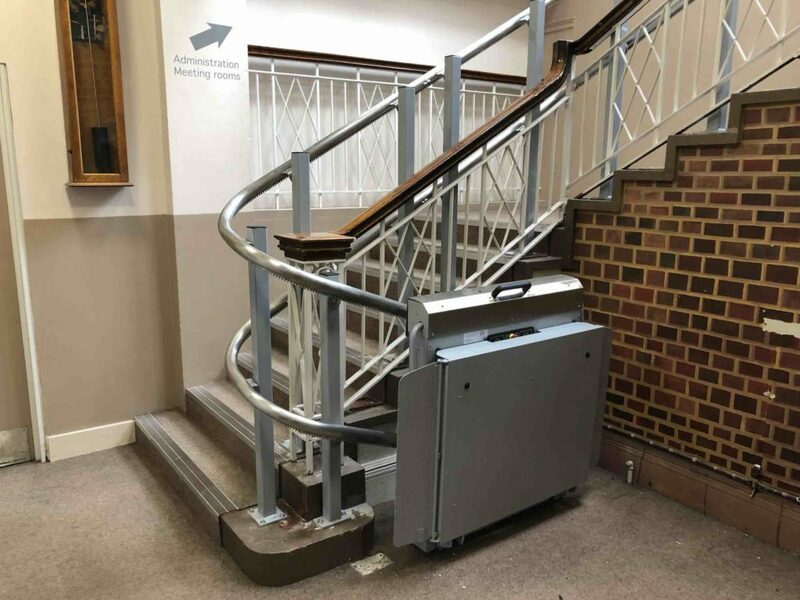 The disabled platform lift has a rated load of 300kg, which means it can take even the heaviest of electric buggies. 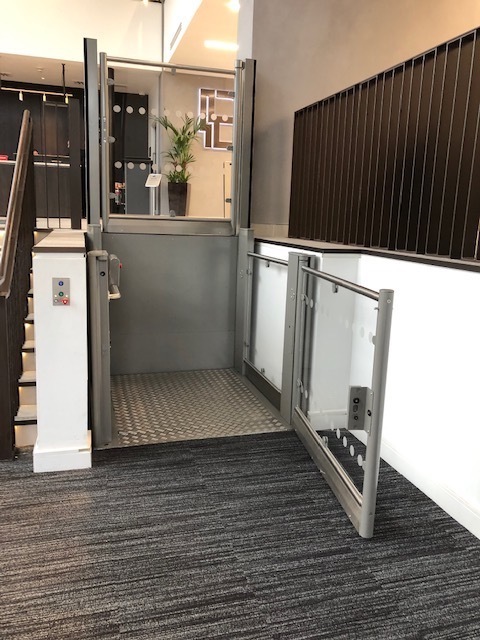 To see more of our projects similar to this disabled platform lift for Bristol University click on the following links: Bitterne Park School, Glass Lift for Offices at Meriden Hall, Dancing Man Brewery and Retail Lift at Optique 2000. 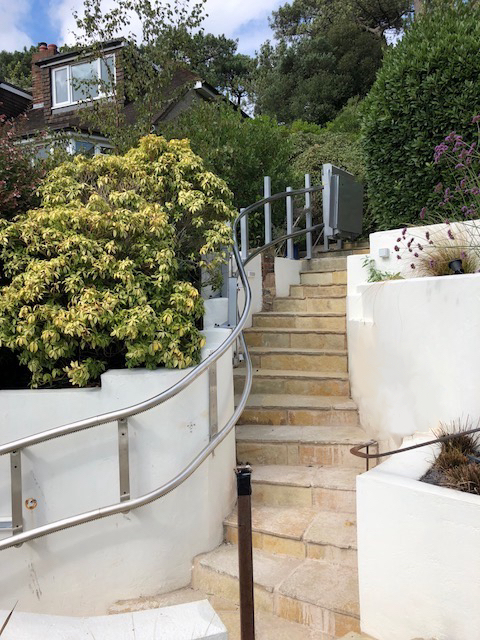 We were approached by a couple from Bournemouth, Dorset who were refurbishing their home. 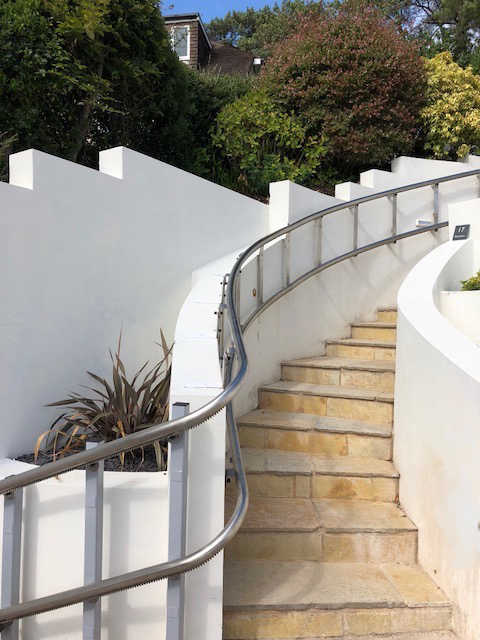 They thought that while they were carrying out the refurbishment they should make their home more accessible. Similar to many properties in the area, the house is spread across 3 floors. The addition of a lift can really open up a home and future-proof it against anything life can throw. 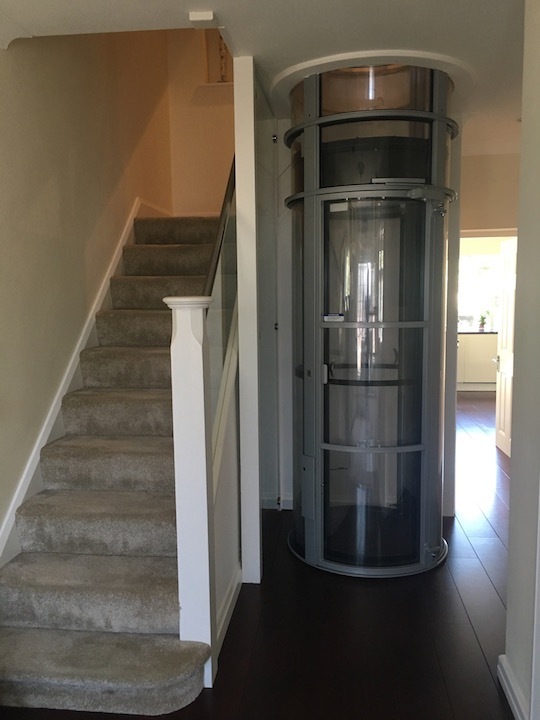 In this instance, the couple had seen photos of a pneumatic home elevator on our website and thought that was the best option for them. They wanted the lift to travel from the hallway on the ground floor to the first floor landing. The lift would then continue into the spare room which is situated on the second floor. The client chose the one person model of the pneumatic home elevator which has a diameter of 750mm. 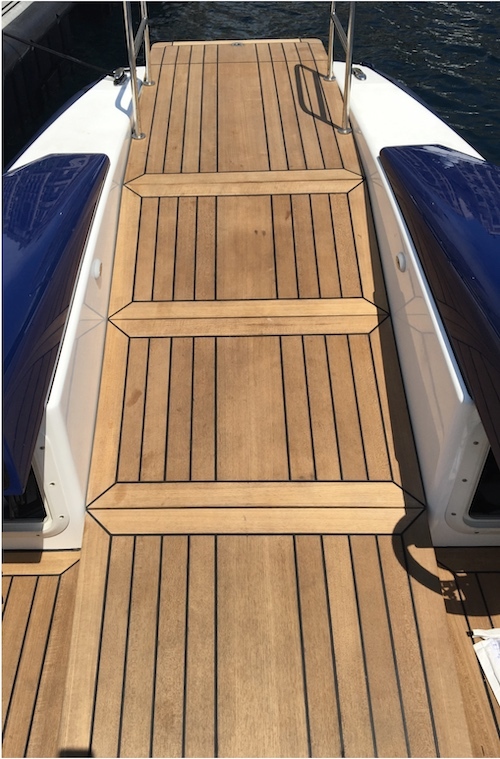 The lift was installed by two of our engineers in under a week. 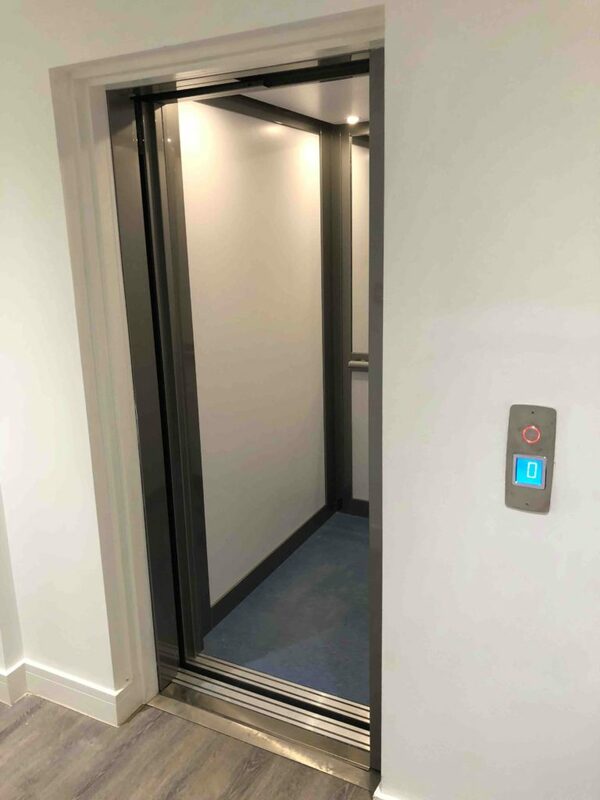 The lift travels just under 6 metres across the 3 floors with a rated load of 205kg. The structure is painted steel with curved perspex panels. 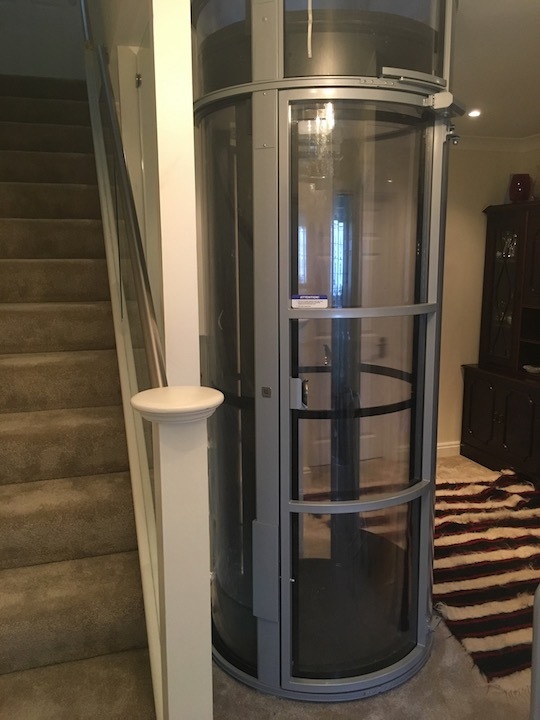 The advantage that a pneumatic home elevator has over a more traditional lift is that they take up less space and can easily be added to a corner of a room. In addition the circular lift shaft can act a sun trap and allow light to flood throughout the house. 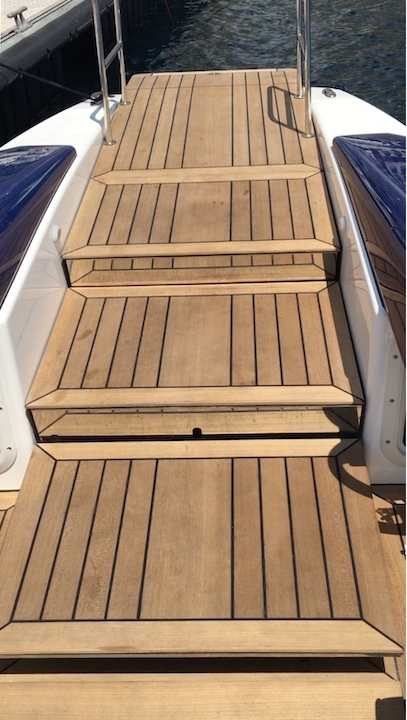 The lift features a 520mm curved door on each floor. 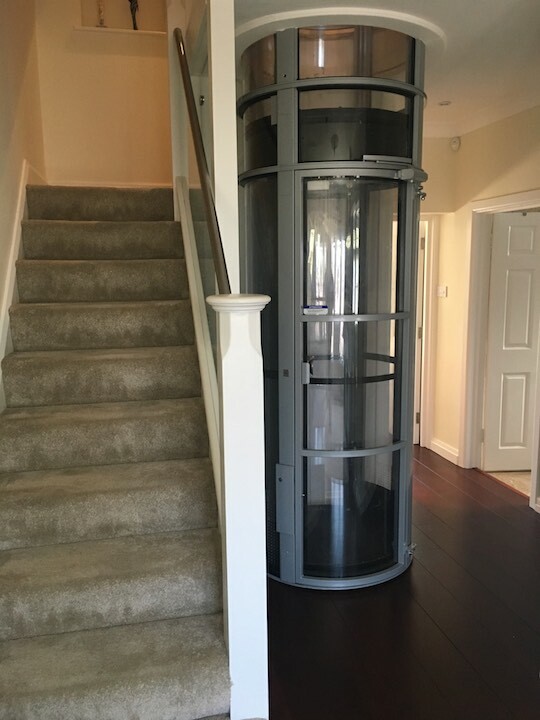 The client uses the lift to even more the vacuum cleaner throughout the house and take the washing upstairs. They also use the lift to move small items of furniture as well as bags and suitcases. 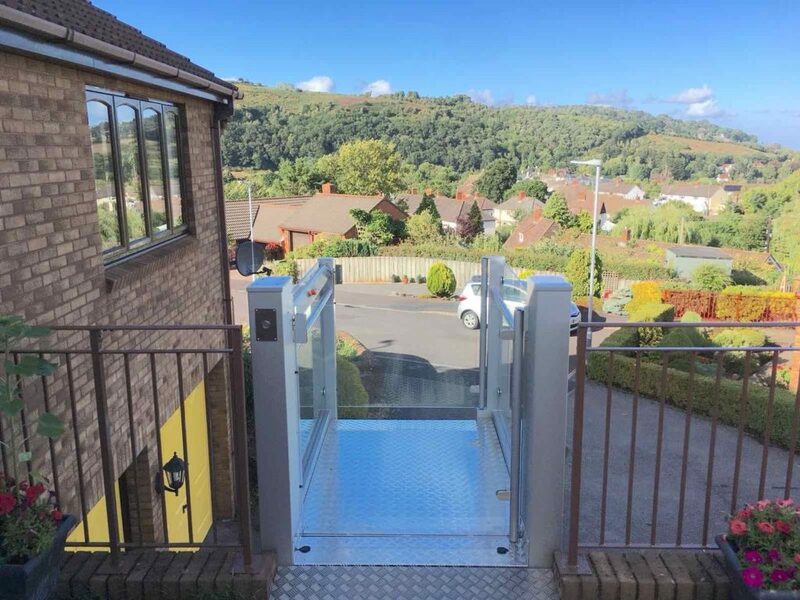 To see more examples of our home and domestic lifts click on the following links: Home Lift in External Shaft in Branksome Park, Small Passenger Lift in Townhouse in Mayfair, Home Lift in Torquay, Home Platform Lift in Whitecliff and Residential Glass Lift in Bosham. 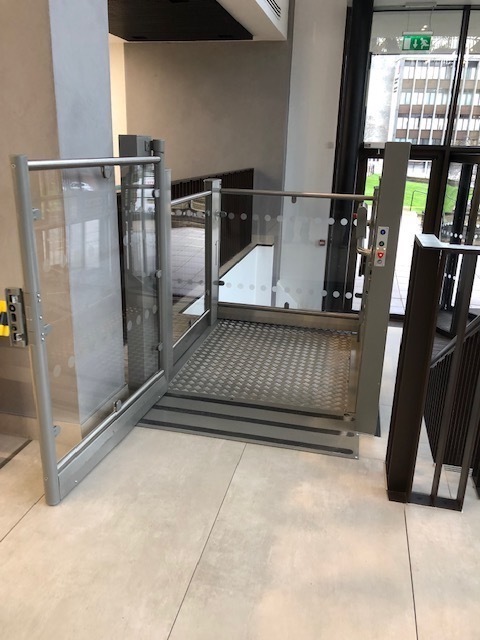 We were asked by Mace to supply and fit an outdoor wheelchair lift for an office refurbishment that they were contracted for. Elm Yard, owned by The Great Ropemaker Partnership, a 50:50 venture between Great Portland Estates plc and Ropemaker Properties Ltd (part of the BP Pension Fund Ltd), is situated on Elm Street between Gray’s Inn Road and Exmouth Market in central London. 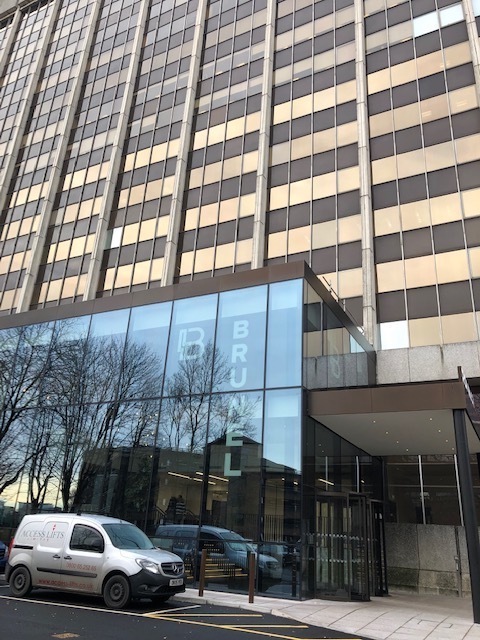 The new collaborative workspace boasts over 50,000 sq ft across 12 floors of premium offices in the heart of one of London’s most vibrant districts. Clerkenwell is a stylish area of London with an abundance of creative and technology companies. Office space in the district is usually made up of refurbished Victorian townhouses and industrial warehouses. We met with the Project Manager in order to discuss the different options available. 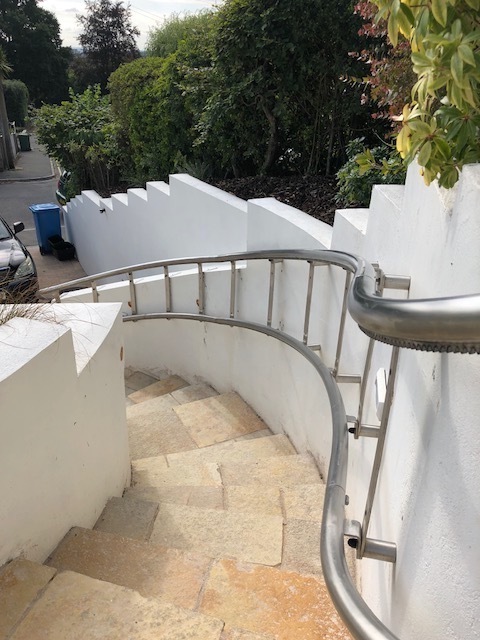 We decided the best option would be an outdoor wheelchair lift on the left hand side of the steps that would provide access to the newly built reception. 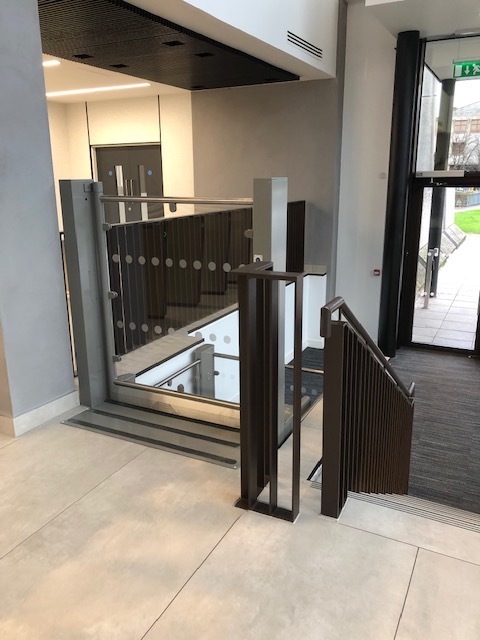 Mace wanted the lift to be able to withstand consistent daily use as well as look stylish against the new refurbishment. 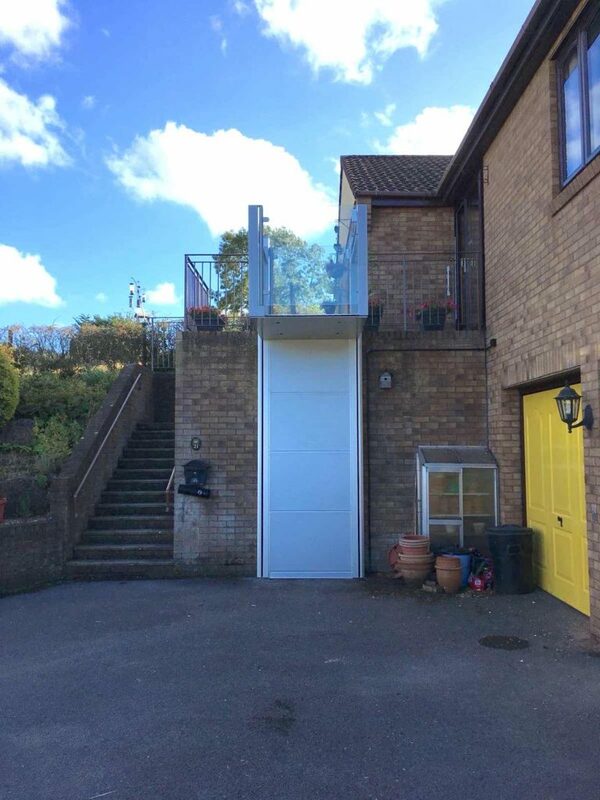 We chose to install a lift that has three glass sides as well as a glass gate. The prominence of glass matches the reception and gives the lift a very modern look. 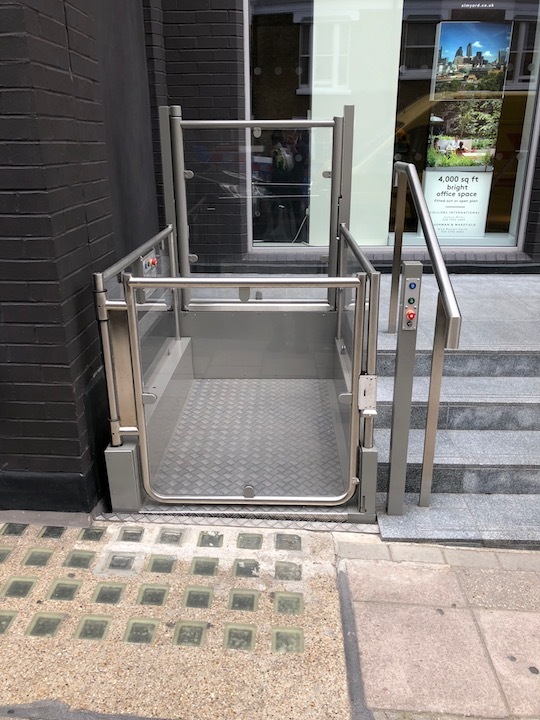 The structural components of the outdoor wheelchair lift were made out of stainless steel which looks great as well as preventing any rust or damage to the lift over the time. 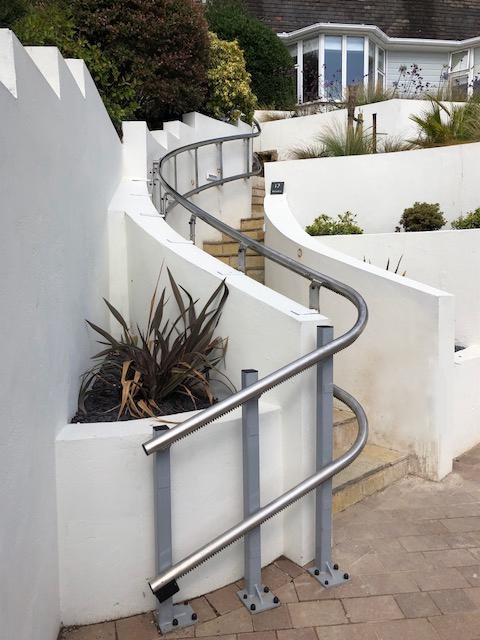 The stainless steel even matches the adjacent hand rails to give a sleek consistent finish. 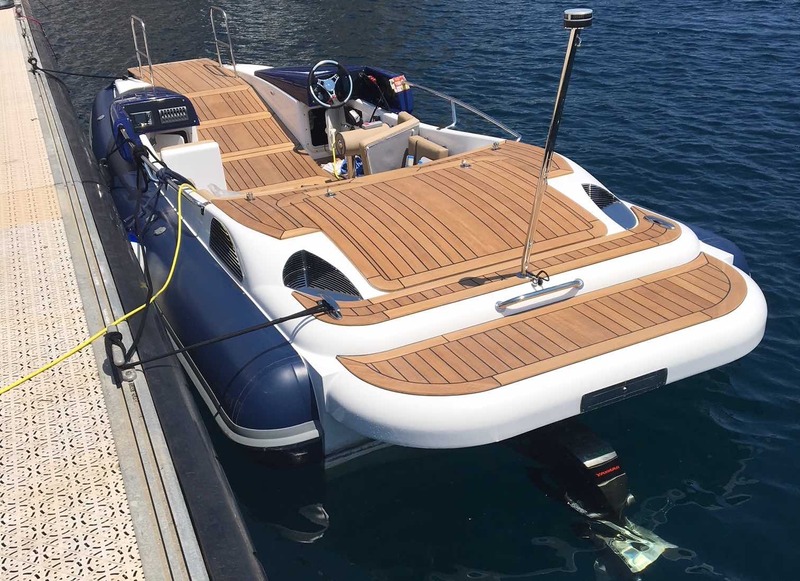 The lift travels over 500mm with platform dimensions of 900mm x 1400mm. Its rated load is 280kg which means it can take even the heaviest of electric buggies. 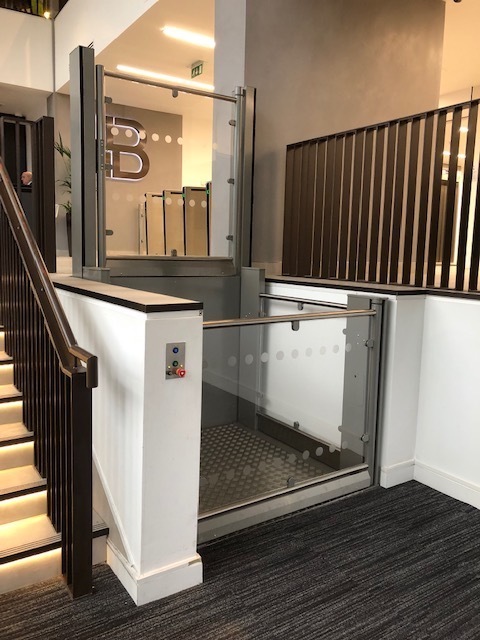 To see more of our platform lifts for offices and commercial buildings click on the following links: Black Mesh Platform Lift in Reading, Black Mesh Platform Lift in Seven Dials Warehouse, Glass Platform Lift in Southwark Council Offices and Collapsable Stairwell Lift in the City of London. 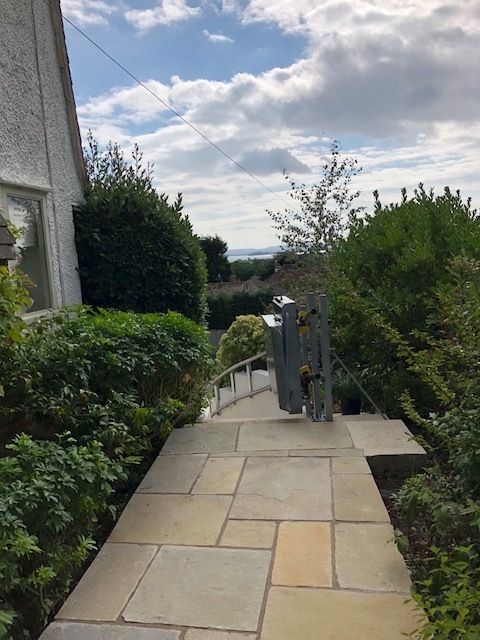 We were approached by a couple in Minehead, Somerset who were looking to make their home more accessible. As with many of our customers, they didn't want to move from their lovely home and downsize to a smaller house such as a bungalow. In addition the house is situated on the hillside above Minehead and the view from their home is fantastic. They had lived in the area for many years and their family loved to come visit on holiday therefore they really wanted to stay put. 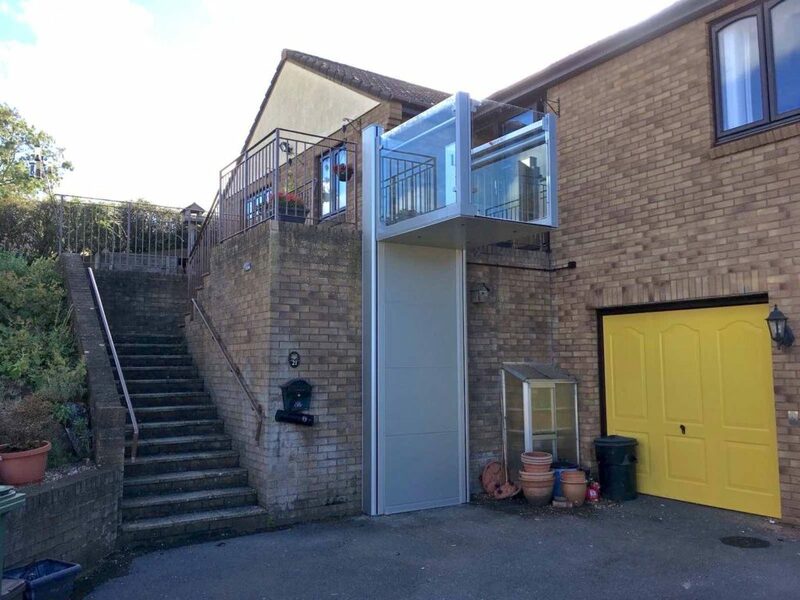 They were looking for an outdoor platform lift that would not only make it easier to access their home but also help move heavy objects such as bins from the house to the garage and driveway. Our team met with the couple to discuss the different options available and to perform a survey of the front of the house. We designed and installed the outdoor platform lift rising from outside the garage to the patio area adjacent to the house's porch. This meant that the second garage could still be used as the lift does not require a pit. 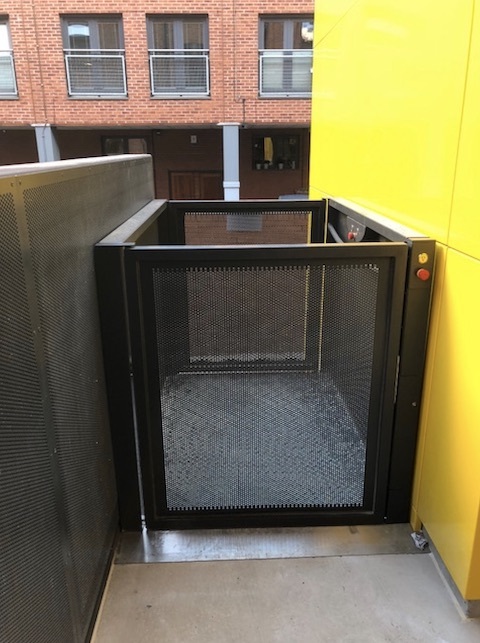 The lift travels just under 3 metres floor to floor with a platform measuring 1100mm x 1400mm, allowing plenty of room to move bins and other heavy items. 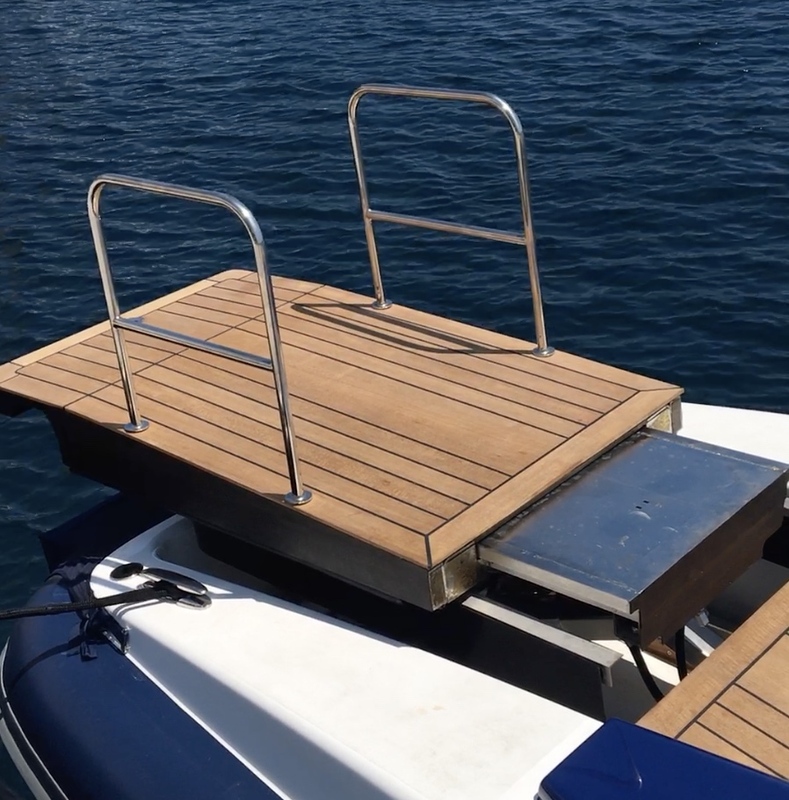 The outdoor platform lift is made out of 316L stainless steel making sure it doesn't rust or corrode over time and ensures the lift is in working order for several years. The side panels are made from hardened glass providing a spacious feel and modern look whilst being completely solid. 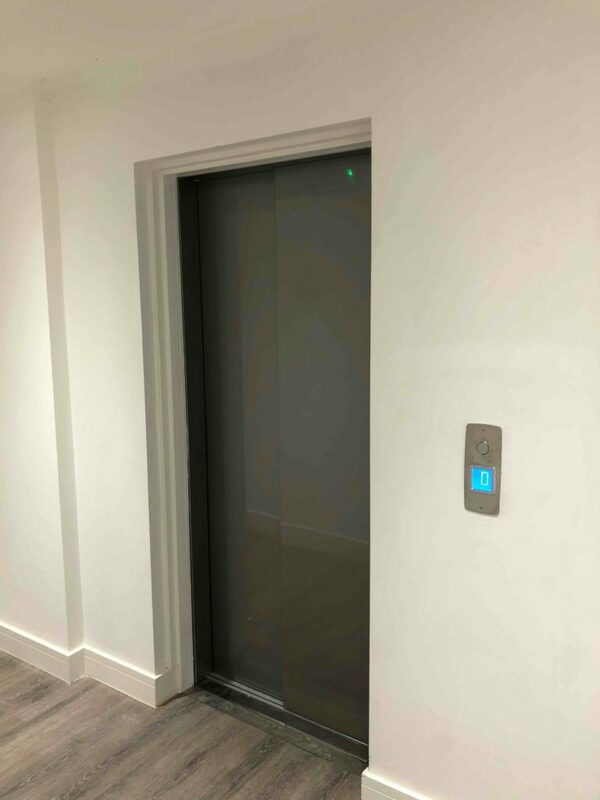 The client said that she is "thrilled with the lift and visiting folks are very impressed, especially the Tesco delivery man!" 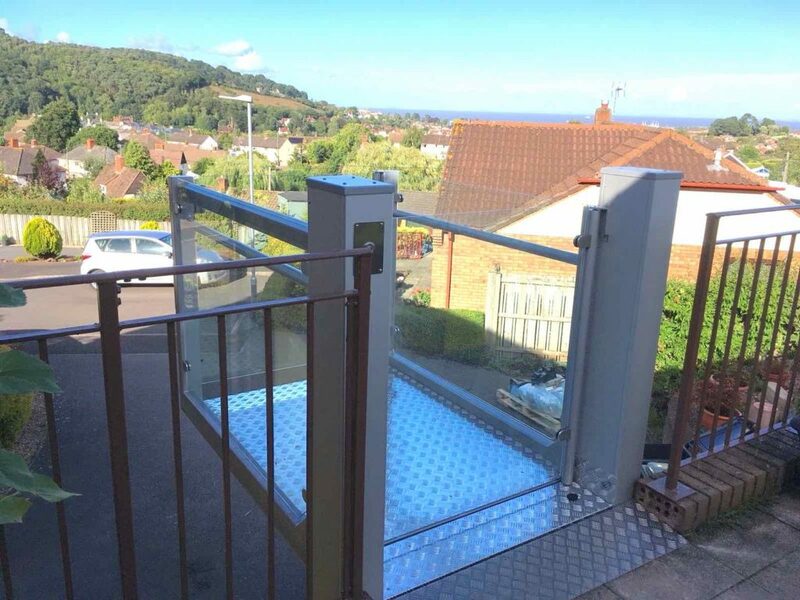 To see more of examples of our outdoor home lifts click on the following links: Residential Glass Lift in Bosham, External Glass Lift in Branksome Park, Outdoor Lift in Powys and Outdoor Inclined Platform Lift in Poole.